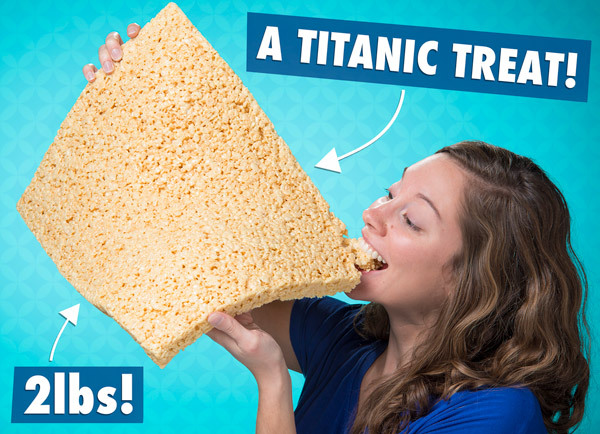 Giant Rice Krispie Treat: Super-sized puffed rice and marshmallow dessert brick. Super sweet, super sticky, and super delicious, Rice Krispie treats are the dessert that you just can't get enough of… until now. This Giant Rice Krispie Treat is a single sheet of Rice Krispie and marshmallow goodness that weighs in at a whopping two pounds! Instead of feeling guilty about wanting to eat the whole pan of Rice Krispie Treats you've just baked, you don't have to bake anything. Just unwrap and eat (or share) as much as you want from the solid sheet! No, you're not looking at the world's smallest human. 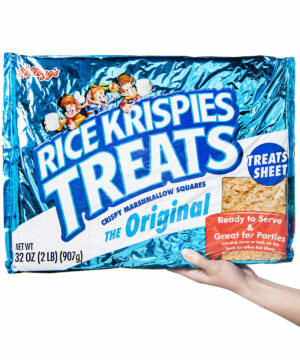 That big-league baked good is a solid sheet of Kellogg's Rice Krispie Treat that's an inch deep, a foot wide, and even longer! Weighing in at two pounds, the puffed rice and marshmallow dessert is an ideal gluttonous snack, an easy way to share, and an excellent base to mold and sculpt an edible edifice. No matter how you use it, this colossal candy is sure to delight the eyes and taste buds of all who encounter it. That's 24 servings of Rice Krispies. Answer: Ingredients: Toasted Rice Cereal (Rice, Sugar, Salt, Malt Flavoring, Niacinamide, Reduced Iron, Riboflavin [Vitamin B2], Folic Acid), Marshmallow (Corn Syrup, Sugar, Gelatin, Natural And Artificial Flavor), Fructose, Margarine (Vegetable Oil [Soybean And Palm Oil With Tbhq For Freshness], Water, Natural And Artificial Butter Flavor [Contains Milk], Datem, Acetylated Monoglycerides, Bht For Freshness, Vitamin A Palmitate, Vitamin D), Corn Syrup Solids, Contains Two Percent Or Less Of Dextrose, Glycerin, Salt, Niacinamide, Pyridoxine Hydrochloride (Vitamin B6), Thiamine Hydrochloride (Vitamin B1), Riboflavin (Vitamin B2), Soy Lecithin.